Applying for certification for Tree Campus involves a very enjoyable day of taking stock of the previous year. They ask about tree plantings, removals, dollars spent, volunteer hours, and community service projects. During a terribly boring snowless winter, it was nice to sit down and revel in our accomplishments during the previous growing season. 2011 was a banner year for tree planting. 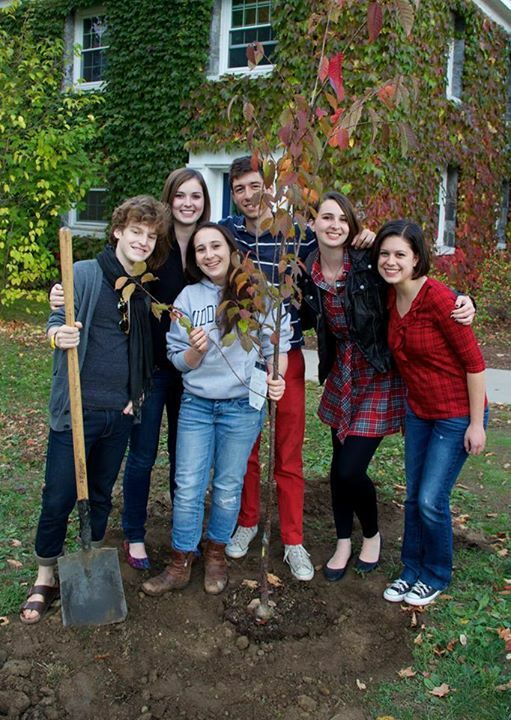 With the Forest renovation, the CFA renovation, our normal tree planting program, and the Atwater Turf Battle construction, Middlebury planted nearly 100 trees on campus this year. We’ve had to remove some too. Storms and hazard tree removals are the most common culprits, although occasionally construction takes it’s toll as well. (It’s this reason I get lots of input from many people before planting, including managers in Facilities and the Master Plan Implementation Committee.) This year 22 trees have been removed. So our Tree Karma score for 2011 is a very healthy 4 1/2 trees planted for every one removed. Informally we try to plant 2 trees for every one removed. Our six year karma average is 3.8 trees planted for each removed. I got asked the other day what my favorite trees planted this year were, and thought it was either the Arbor Day planting, the large trees planted around Ross Commons, or maybe the rare trees planted to the west of Munroe, including a Stewartia, a variegated Tulip tree, and a rare yellow Magnolia. 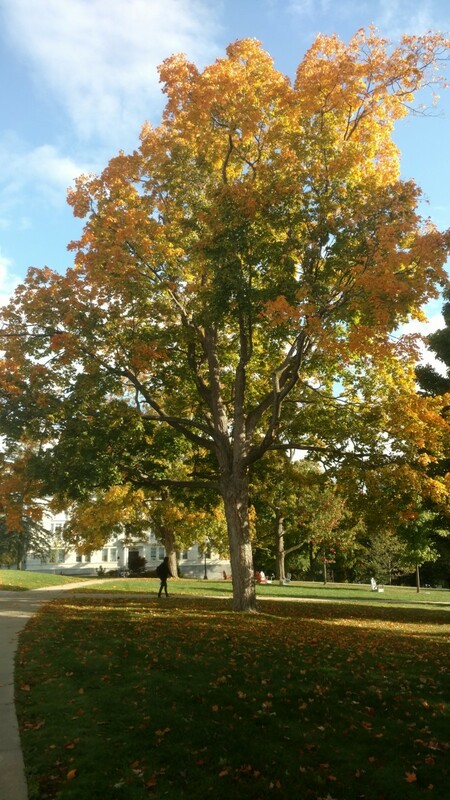 Or maybe the disease resistant elm in Adirondack Circle. But how can I single out one child over another? We’re planting this spring too, mostly locally grown trees, in various locations all over campus. There is a method to our madness, we don’t just randomly plunk trees down all willy-nilly. One example is this year’s Arbor Day planting, just north of Battell. That awkward little triangle of grass lets Battell Beach lose it’s structure on that corner, and the space of the beach bleeds into the quad in front of La Chateau. The trees planted there will form a wall of sorts, segregating two spaces, and probably extending the usable lounging space of the edge of the beach. Other places trees get planted are near trees that are dying, albiet slowly. I don’t like removing trees, and it makes me feel better to know when I do remove a tree I’ve already got it’s replacement planted and well established nearby. 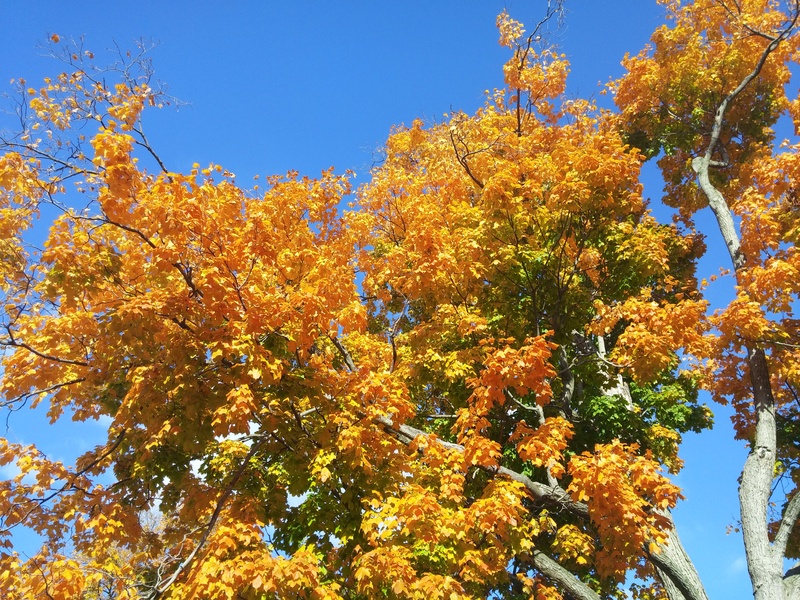 Look for some new trees near the Davis Family Library for this reason. And by all means, join us today at 1 to plant some more-north of Battell Hall. We’ll allow you to get dirty. 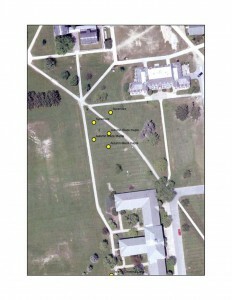 This entry was posted in Midd Blogosphere and tagged Tree Campus, tree planting, tree removal, Trees on May 18, 2012 by Tim Parsons. I measure my life in tree plantings. Every time I come home from the Burlington airport, I drive down Dorset street in South Burlington and visit a Blue spruce I planted on a landscape job my first year out of college, 1989. It’s over 40 feet tall now, making me old. A paperbark maple in front of my mom’s house in Connecticut is a lot smaller, but slows traffic down on the road in it’s awesomeness. A pair of honeylocust in front of a local church down there planted at my very first landscaping job now towers and dominates the little front yard. A Kentucky Coffeebean tree in my side yard in Weybridge planted when we moved in about 11 years ago is now starting to look like an actual tree, the trunk about 4″ now (it started small, I’m cheap). Middlebury College has once again been certified as a Tree Campus by the Arbor Day Foundation, and the landscape department is celebrating by planting trees (naturally). Come join us Friday afternoon from about 1-4 just north of Battell as we plant 5 large shade trees. The holes will be pre-dug, so it won’t be too much work. (Sorry, can’t let you run the backhoe, I would if I could). Here’s your chance to make a mark on the Middlebury campus, and always have a friend to come visit when you return to paradise. Or maybe we can call it my open office hours, no appointment necessary. Visits need not be limited to 15 minutes. This entry was posted in Midd Blogosphere and tagged Arbor Day, Campus community, landscape, Tree Campus, Trees on May 16, 2012 by Tim Parsons.